I’m starting to ease into some of the spring nail polishes now. 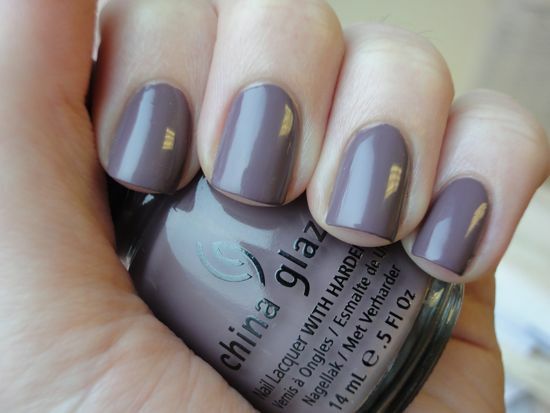 China Glaze’s Below Deck is from the Anchors Away collection-it’s a pretty, mauvy purple-taupe-grey. It’s really a mix of all of those colors. I liked it so much that I wore it for four days! I did add some sparkly topcoat at the end to keep it going. This color applied really well. I like the China Glaze brush better than some of the brushes in more expensive polish-it’s just wide enough and stiff enough that I find it to be very easy to control. This took just two easy coats to be fully opaque. And it’s such a nice, soft color–it has more pink than the taupey-purple colors from last fall. My pictures didn’t show it quite as pink as it looks in real life. After a few days, I did add CND Gold Shimmer. This combination reminded me a tiny bit of Dior’s Aztec Chocolate (only lighter), since the gold shimmer made the brown and purple in Below Deck seem like a really cool-toned brown. This polish is supposed to be the closest China Glaze could come to a re-creation of a popular older shade, Channelesque. I don’t have that one to compare, but Below Deck is a nice, easy to find option if you were a Channelesque fan.